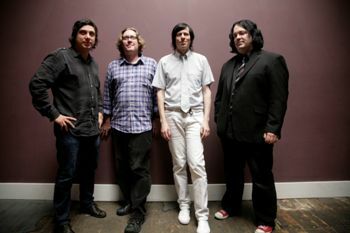 The Posies are an Alternative Rock/Power Pop band formed in Bellingham, Washington in 1987 by Jon Auer and Ken Stringfellow. The band released their debut album Failure in 1988. Their second album Dear 23, released in 1990 was their major label debut and was well received. It included the singles "Golden Blunders" and "Suddenly Mary". They released 3 other albums before focusing on other projects. In 2005, they made their comeback album, Every Kind of Light. 2 songs, "I Guess You're Right" and "Love Comes" were packaged as sample music in Windows Vista computers. In 2010, they released their latest album Blood/Candy. Ken Stringfellow and Jon Auer have also released their own solo records, with Ken's most recent album, Danzig in the Moonlight, being released in 2012. Achievements in Ignorance/Refuge in Audacity: At a time when the local rock scene was limited in exposure to the "Subterranean Pop" magazine and radio program (which evolved into the Sub Pop record label), the Posies were able to get early singles onto mainstream Seattle radio with the national hitmakers simply by walking up to the front desk with their cassette. Album Title Drop: Frosting on the Beater has this in "Solar Sister" and "Every Kind of Light has this in "Anything and Everything." Cover Version: The 2000 boxed set features versions of "Wiggly World", "What's Going Ahn", "Surrender", "Dreaming", and the Jeff Beck Group instrumental "Beck's Bolero". Follow the Leader: Frosting On The Beater and especially Amazing Disgrace feature a heavier guitar sound than the rest of their discography, putting them more in line with Alternative Rock trends of the mid-90's. Greatest Hits Album: "Dream All Day: The Best Of The Posies"
Revolving Door Band: As the "former members" list shows, the rhythm section has been in flux for the entire run. Shout-Out: The song title "Golden Blunders" is one more in the great tradition of Beatles shouts, with the unusual twist that Ringo ended up covering it. 10-Minute Retirement: Following a 1998 breakup, Auer and Stringfellow worked together on a greatest hits collection, a boxed set, an unplugged live album, and toured as part of the reconstituted Big Star before returning to work as the Posies. Unplugged Album: Two - In Case You Didn't Feel Like Plugging In, a live album and Nice Cheekbones and a Ph.D, an EP featuring new originals written by Auer and Stringfellow, released in 2001.